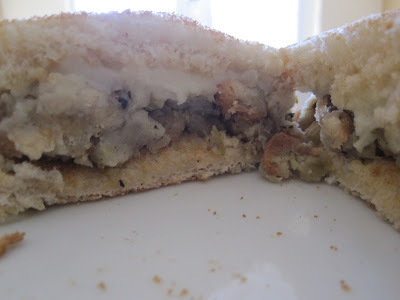 mashed potato and stuffing sandwich. I love turkey, mashed potato, and stuffing sandwiches! They're the best. I'm going to making a post about turkey pot pie soon...check it out! Stuffing sandwich = hot bread on bread action... count me in. if only i'd used thanksgiving dinner rolls instead of sliced bread! it could have been a leftover trifecta. Love your blog, Shelly! Jenn sent me the link...the pumpkin cupcakes were divine!